London: The SkillTree Knowledge Consortium and Great Place to Study – Research Institute, felicitated leading entrepreneur, industrialist & educationist, Mrs. Sushma Paul Berlia, President of the Apeejay Stya & Svran Group and Chancellor of Apeejay Stya University with the Exemplary Award for her Outstanding Contribution to Education and Industry at the 3rd Great Place to Study India Edition Awards in London on 22nd February 2017. She has demonstrated excellence and the highest standards of ethical conduct, integrity and civic and social responsibility for her contribution in the area of education and industry. She has been recognised as someone who exemplifies the promise to the Indian education ecosystem for nurturing it and taking it to global standards. For the first time, the Skill Tree Consortium has felicitated and recognised the contribution of an industrialist towards the development of education services in India. 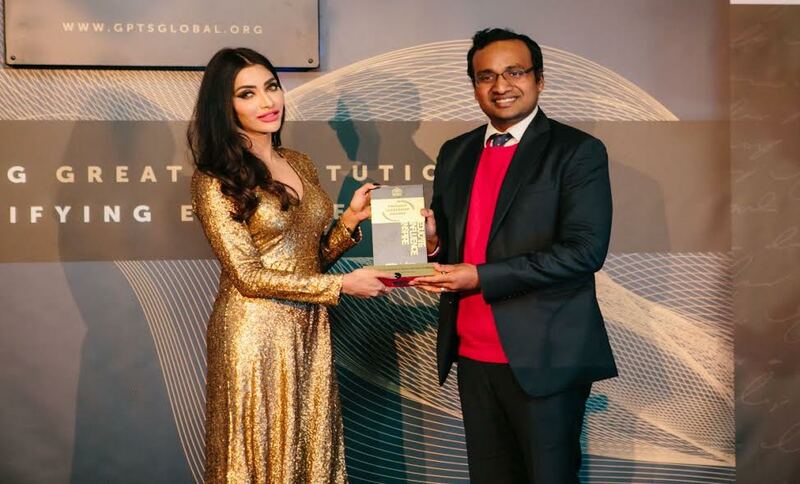 Mr. Aditya Berlia, Member, Management Board, Apeejay Stya & Svran Group, Joint Secretary, Apeejay Education Society and Pro-Chancellor of Apeejay Stya University received the award on behalf of Mrs. Sushma Paul Berlia. Mr. Berlia said that Mrs. Sushma Paul Berlia attributes her achievements to her father and mentor, Dr. Stya Paul, eminent industrialist, educationist and philanthropist. He shared that Apeejay Education Society was established by Dr. Paul over five decades back as a way of giving back to society. Mrs. Berlia’s involvement in Education (earlier as the Vice-President & President of the Apeejay Education Society, and now as Chairman, Apeejay Education Society & Chancellor, Apeejay Stya University), and in Industry (as President of the Apeejay Stya & Svran Group comprising diverse verticals like Life Science, Chemicals, Real Estate & Development, International Trading & Distribution, etc.) have given her a first-hand insight into the problems facing the education sector, right from K-12 to higher & professional education. It gave her an understanding into the needs of the industry, the disconnect between the graduates being produced by our universities, and the problem of their employability – especially with respect to their industry readiness, ability to think and analyse critically, to learn for life, and to work collaboratively in teams. As a response to these, her corporate experiences have motivated her to implement measures and strategies to make education more industry-relevant, innovative and skill-focused.